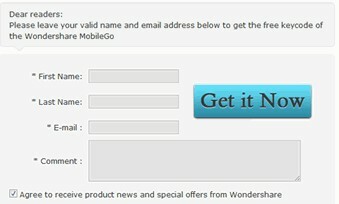 Get Wondershare MobileGo license for free for everyone | aeBeta : IT Resources and Reviews , Software Tips and Promotions ! I have nothing to write on how popular the Android is on Mobile phone market. And I myself is one of the Android users. In fact, more and more Android manage software will be there for end users to choose from. Wondershare MobileGo is just among the best ones I think. Recently, I found that Wondershare is giving away MobileGo licenses free for everyone. It is time to tell you all guys now ;p.
An all-in-one phone manager to master your Android phone on PC. For any questions of the giveaway products within a week, feel free to send a message to support@wondershare.com to get punctual solutions. However, due to our company’s policy of giveaway products, we will not provide tech support in future. Thanks in advance for your understanding on it. Please check your “Trash Bin” or SPAM folder if you have not received the registration code from us. I have been online on the net more than 3 hours these days, nevertheless Irrrve never discovered any kind of interesting content including your own house. It can be charming price adequate for me personally. I believe, in the event that all web owners plus blog writers manufactured good information when you do, websites would have been a much more handy than in the past.